Not to be confused with Stock exchange. An exchange, or bourse /bʊərs/ also known as a trading exchange or trading venue, is an organized market where (especially) tradable securities, commodities, foreign exchange, futures, and options contracts are sold and bought. The "Huis ter Beurze" (center) in Bruges, Belgium. The term bourse[note 1] is related to the 13th-century inn named "Huis ter Beurze" owned by Van der Beurze [nl] family in Bruges, Belgium, where traders and foreign merchants from across Europe, especially the Italian Republics of Genoa, Florence and Venice, conducted business in the late medieval period. The building, which was established by Robert van der Buerze as a hostelry, had operated from 1285. Its managers became famous for offering judicious financial advice to the traders and merchants who frequented the building. This service became known as the "Beurze Purse" which is the basis of bourse, meaning an organized place of exchange. Eventually, the building became solely a place for trading in commodities. In the twelfth century, foreign exchange dealers in France were responsible for controlling and regulating the debts of agricultural communities on behalf of banks. These were actually the first brokers. They met on the Grand Bridge in Paris, the current Pont au Change. It takes its name from the forex brokers. In the thirteenth century, the Lombard bankers were the first to share state claims in Pisa, Genoa, and Florence. In 1409, the phenomenon was institutionalized by the creation of the Exchange Bruges. It was quickly followed by others, in Flanders and neighboring countries (Ghent and Amsterdam). 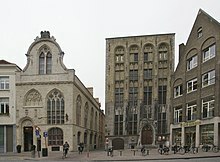 It is still in Belgium and the first building designed to house a scholarship was built in Antwerp. The first scholarship organized in France was born in Lyon in 1540. The first documented crash took place in 1636 in Holland. The prices of tulip bulbs reaching excessively high levels, known as the Tulip mania. The price collapsed on October 1. In the seventeenth century, the Dutch were the first to use the stock market to finance companies. The first company to issue stocks and bonds was the Dutch East India Company, introduced in 1602. The London Stock Exchange started operating and listing shares and bonds in 1688. In 1774, the Paris Stock Exchange (founded in 1724), say the courts, must now necessarily be shouted to improve the transparency of operations. In the nineteenth century, the industrial revolution enables rapid development of stock markets, driven by the significant capital requirements for the finance industry and transport. Since the computer revolution of the 1970s, we are witnessing the dematerialization of securities traded on the stock exchange. In 1971, the NASDAQ became the primary market quotes computer. In France, the dematerialization was effective from November 5, 1984,. The development of information technology during the late part of the 20th century led to a new type of electronic exchange that replaced the more traditional physical markets. This led to new definitions in financial regulations that recognized these new exchanges, such as the Multilateral trading facility in Europe and Alternative trading system in the United States. Regulators also started using the term trading venue to describe the wider definition which encompasses both traditional exchanges and electronic exchanges. Exchanges bring together brokers and dealers who buy and sell these objects. These various financial instruments can typically be sold either through the exchange, typically with the benefit of a clearing house to reduce settlement risk. In practice, futures exchanges are usually commodity exchanges, i.e., all derivatives, including financial derivatives, are usually traded at commodity exchanges. This has historical reasons: the first exchanges were stock exchanges. In the 19th century, exchanges were opened to trade forward contracts on commodities. Exchange-traded forward contracts are called futures contracts. These "commodity exchanges" later started offering future contracts on other products, such as interest rates and shares, as well as options contracts; now they are generally known as futures exchanges. ^ The term bourse is derived from (Ancient Greek: βύρσα, translit. bursa, lit. '"the skin stripped off a hide"') which was later used as bursa in Medieval Latin to refer to the "purse". ^ "The stock market: from the 'Ter Buerse' inn to Wall Street". nbbmuseum.be. ^ Crump, Thomas (1 March 2006). "The Dutch East Indies Company – The First 100 Years [Transcript]". Gresham College (Gresham.ac.uk). Retrieved 21 August 2017. ^ "Sustainable Trade: Changing the Environment the Market Operates in, Through Standardized Global Trade Tariffs" by Zoltan Ban. https://books.google.co.in/books?id=-Q6mMdieX0EC&pg=PA219&dq=1688+AND+%22london+stock+exchange%22&hl=en&sa=X&ved=0ahUKEwjapLqesObPAhXpz1QKHQlTA2o4ChDoAQgyMAA#v=onepage&q=1688%20AND%20%22london%20stock%20exchange%22&f=false. p. 219. ^ Stock Exchanges are the most publicly recognized places for buying and selling shares. They are easily the single most important component of the secondary market for corporate shares. Over-the-Counter Options. About.com. "Bourse" . Collier's New Encyclopedia. 1921.